other parts to build with. asked the man if he had certain parts. that were already twisted up. point, which was totally untrue. quality components that insured success. Later others picked up the slack. Last edited by BroMikey; 02-24-2018 at 09:44 PM. Rick some facts I wanted to share, points 2-8 are your own words on the August 8th 2013 phone conversation we shared. 1. You wait until the Bedini's are dead before you start talking negatively about them. 2. You told me John was like a Dad to you. 3. You told me the split was a total shock to you and you did not know what to do. 4. You told me you paid 10 percent royalties to John for all Bedini kits sold. 5. You told me that even though your charger sales were cut off by Energenx, you were still paying 10% royalties to John for all Bedini kits sold. 6. Rick I left you as a dealer because you would only give me a 10% dealer discount for all charger sales generated, Energenx offered more sales commission and you, Rick, were given the opportunity to match the commission and you would not so I made a business decision and left you as my supplier and went with Gary and John. 7. 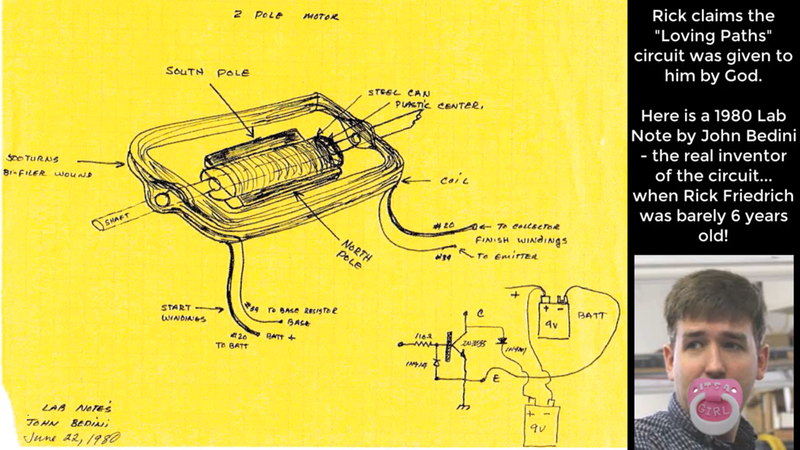 You also hinted at removing the potting material from the chargers to see the circuitry and commented to me on the fact that the circuits were not the ones used in Johns' patents and therefore anyone could build such a charger. 8. Rick even though I moved over to Energenx you and I were still on good enough terms for you to ask me to come on board with you, after the split, and sell the charging equipment, that you currently sell on your website, as you may set up production of chargers in Canada or China and go head to head with Energenx. Rick you agreed some time ago to repair my charger and have yet to do so as agreed. You will not return my emails and or phone calls even though you say "I answer all my phone calls". I have had enough of you... You call yourself a Christian man yet you embarrass the Lord by conducting business like a thief. I have come to terms that it will never be repaired by you, I will never receive it back from you and it is a total loss. Last edited by jettis; 02-25-2018 at 03:40 AM. Rick Friedrich is trolling YouTube videos under other people's names or its people without enough sense to see he is a sociopath. Last edited by Aaron; 02-19-2018 at 10:38 PM. Thanks aaron for being a stand up guy, one of a kind. We can't have all sheep. Last edited by BroMikey; 02-20-2018 at 12:22 AM. Bleah. More controversy. . . I already get more than enough of that in the anthropomorphic arts enthusiast (furries) culture. Interesting but if I recall correctly; Rick's claim is something along the context of this all dating back to far earlier patents before any of us where even born... So; is there really any such a thing as an original idea if all based on much earlier patents and all is merely just different applications or versions of that earlier work such as the Benitez patent Rick keeps referring to as well as others such as some Tesla patents he is now talking about? I don't know what to think. Don't want to think. It's to much tedious work for my old, lazy, hobbyist tail. And of course; none of these patents actually include specifics good enough to be a "How to build it with modern parts" guideline. Patents are usually just a general description designed to protect a prototype or proprietary device from infringment. A diode? A transistor? An inductor? Really? What kind? There are MILLION to choose from. If John's work is based on earlier Benitez work but then Rick stole John's later work that was already earlier work stolen then; what?!? *shrugs. I just want a self running system that runs! Doesn't have to provide any extra power. Just want it to self run and preferably with capacitors only. Mechanical or Solid state. Don't care. Just want a kit or a comprehensive "how to" complete with parts list and schematic to build it THEN; I'll have more interest in HOW it works. I watched his 90 minute video while I kept thinking he was going to show me something ground breaking but in the end; I guess I failed to find the forest through all his trees. . . BUT; he is now building a VERY interesting looking new system that appears to be something that John never built (or simply another twist on other work such as Kromrey) and looks REALLY Interesting to me so; did he steal that? OR did he actually learn stuff from John (and Kromrey and many others) and now he is moving well BEYOND that past with a whole new resonant system in the present? Is there anybody else offering a resonant system in complete detail or a ready made kit I can just buy that doesn't cost $5K and has defective machining or incorrect instructions or doesn't actually resonate? If there's a lot of controversy then; maybe I should go ahead and order the kit immediately before supplies dry up. I just don't know. *shrugs. I just want a self running mechanical system or a solid state system that is OBVIOUSLY using source field energy and hopefully; putting a little extra out to be useful for something. I am sick of batteries! Don't want batteries!! Unless of course; it's a battery that NEVER needs charging and PMM4GHYBRID refuses to answer THAT question about HIS battery. he has his own virgin so everything must be cool. Give me a break. they will always be the kind of person who needs to lie to be normal. If they don't lie and cheat they feel empty. That is what is on the table. Thanks for all your vid's, been a follower for years. Last edited by BroMikey; 02-20-2018 at 06:40 AM. I'll post my response here to you as well. AND, it includes a video of a circuit I made that runs on a capacitor that charges itself back up - what you have been looking for apparently. The further from Rick you get, the closer to the truth you are. And the picture is not controversy - it is indisputable proof that Rick is a liar and thief. How is that controversial or debatable? You're mixing different circuits and methodologies. Again, John’s work is NOT based on Benitez – where did you even get that from? The only connection to Benitez's work is the "Tesla Switch" and John has said for decades that he learned it from Ronald Brandt. 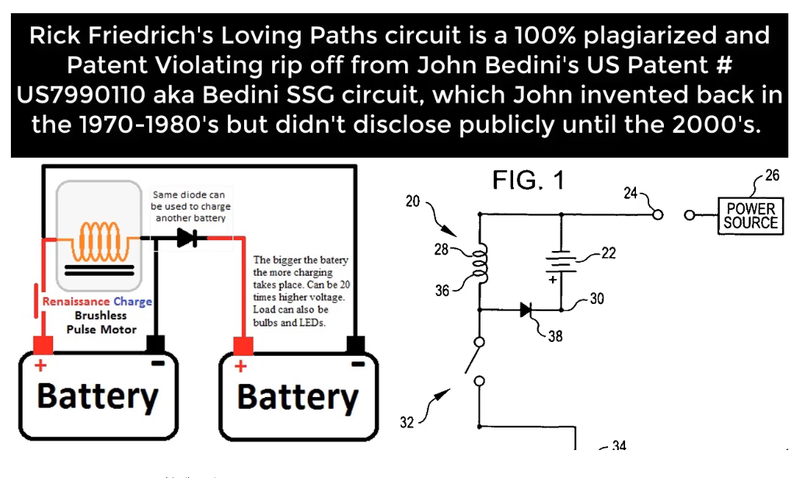 That doesn't have anything to do with Rick's stupid "Loving Path" ripoff of John's patented SG circuits. Rick doesn’t know how to properly measure input vs output. Rick hasn’t made any progress past what he stole from John and others - he never actually understood John's work. He is a con artist and is only making many variations of the same fundamental circuit. Show me the diagram of “his” new resonant system – a simple schematic and I’ll tell you where it came from or what it will do. Yes. I have missed a lot. And from my viewpoint; I just saw all that Rick was saying in his videos after the passing of John and his brother. I was being very lazy, just watching videos and not paying any attention to these forums. I was pretty much on 'hiatus' for about a year as I allowed other things to distract me in this life but now; gaining interest in these things again. I am VERY interested in the Kromrey converter and currently reviewing those videos from Aaron and Peter including the new coil winding revelation so; I do intend to bring that project back to the forefront. Anybody want to buy a well built 4 pole mini with alternator along with an un-built dual layer version of similar style? I do have a hard time following Rick. His videos are very long, boring and confusing and he keeps saying something along the lines of: 'I want to teach you the principles but never show you how to actually build it and I am worried about health effects so not going to show you high power, arcs and sparks systems'. . .
Gimme a break! Want new energy system NOW so I can get RID of the annoying, unhealthy 60hz system that surrounds this lousy, ancient house. Please, can we all keep it on the science and keep the drama out. Let's play nice in the free energy sandbox. There will be 4 posts on this. From Rick F. His response to this post. When I first became involved with the Bedini's Aaron used to come around from time to time with some new thing he was pushing on people. John told me that he didn't think much of him but John always loved people's attention. He told me Aaron once gave him one of his magical pills for his vehicle and it ruined his engine. I never took Aaron seriously because of his lack of credibility. His latest statements show that he has not changed in that respect. I never did Aaron wrong so there is no reason for him to be so aggressive against me. It is him that is doing me wrong. I let him sell my chargers with Peter. I spent years with Brett designing, testing, and selling these chargers. Aaron later jumped on to my work and for some time I allowed him and Peter to sell my chargers as my dealer with my labels and used my testimonies on his website. Later they all went behind my back and bypassed me while still using my labels and testimonies for years. He also jumped onto the work I had done in the forums. Essentially he aggressively moved in and became an influence to take over all of my work in regards to the chargers and the forums. He did very little in regards to sales with the chargers, and provided no customer service which we had to provide to his customers who could not get through to him (even years after all ties were cut). For years we were blamed for his failures to his customers, as well as Bedini's failures in making bad product that didn't do the same thing. I will grant that Aaron has done a good job of 1. making money in selling information, 2. making a big network with forums and websites (that I didn't have the time for), and 3. getting Eric Dollard to do videos. A better forum platform was needed, Aaron moved things to the next needed level, and I could not argue with that. I was too busy with actually making products and showing real overunity systems to mess around moderating the forums anymore. I let go of them and let others run the groups. There were many mistakes in that regards, but you can only do so much when you are volunteering for free. I appreciated everyone trying to help and move things forward, so I didn't try and compete with Aaron on his forums. Aaron endorsed my kits, especially the 10 coiler as something important and beautiful, on his new forums. So did Bedini there and in video. I have shown video responses to all these claims of Aaron over a year ago after John and Gary passed away. Like I said, Aaron was one of my dealers and promoted my work that he now lies about as if he didn't or that I was doing the opposite at the time. So Aaron is fighting himself in the same way earlier Bedini contradicted later Bedini about me. Their own testimonies absolutely contradict each other. Aaron and Bedini before him, tried to take advantage of the fact that people do not pay attention to details and that they also represented, by careful maneuvering, a kind of base of a movement. Therefore they presented slanderous statements against me with no details with the expectation that people would just believe their lies. But what wrong did I do to either of them for them to do this to me? It was all because they felt they didn't need me anymore and wanted to cash in on the great potential I created for them by my work. Or was it because of me showing a 26' cabin cruiser boat at my 2011 Convention (after which most of these people turned at once on me). Gary Bedini very frequently faulted me and Tony C. for making John a sensation which he said turned John into someone puffed up and unreasonable. I see now that he was right about that and that was one of my main reasons for coming out with the truth about John after so many people were mislead by him in that way. That was my biggest fault in all this, that I was so supportive of John. I fell for the same hype about him that Bearden first created back in 1984 when he put him into play. Everyone wants a legend and Bearden gave them one. But when you listen to the 84 audio Open Mind program you realize that John had really just begun learning about these things that year because of Bearden's appearance on that program. He also learned from Newman and Adams. He copied everyone and I am not sure if he really invented anything significant. And that is fine so long as you don't act like you invented everything this world has. At some point, according to his own brother Gary, who was the CEO of Energenx and Bedini electronics, John developed a completely distorted view of himself, just as Aaron is doing in boasting of himself over others (I won't say that I am anything over Aaron or anyone, but I am allowed to be satisfied with most of the work I have done). John gladly received recognition from others about inventions he copied from others. I just received word last week about a big name who actually showed him the SG circuit. But the idea really is in the 1974 patent of the top spinner, and the 2000 school girl science fair demonstration was not much more than applying that to an Adams-like motor that had a generator coil to power an LED. The battery would eventually run down just like the spinner. It was fascinating, but nothing new. Yes the bifilar coil had an added importance but there is no proof that John invented any of this. Aaron attacks me as if all these things belong to John. He is not familiar with patent law, patent history, and even the prior patent art Bedini cites in his patents. He perpetuates conspiracy theories like John Bedini: the Myth of Lone Genius (like the one book against Tesla recently published). John admitted to copiying Newman with the window motor. He and Ron Cole tried to improve upon it with transistor switching. Both Newman and Bedini made specific coils around the rotor where I did not see the need for that and found a more practical solution for actual products (and real overunity products were not what either of these men ever gave people). In the same way the monopole was from Adams who probably was not the first either. The chargers also have a history dating back to the 1930s. And while John was involved in the earlier "radiant" charger designs that never were sold (except for the very few first RC-2A12's) he had very little to do with the actual products we made and sold under my Renaissance Charge name. John was usually off wasting time with something unimportant while the rest of us were working hard. While I did not make everything about these chargers, or even do most of the work, I did come up with idea and functionality of the chargers, some of the design, did much of the testing, and provided a base of sales and customer service for them in the real world (other people like to talk and not do anything useful). Consulting later with top patent attorneys I learned that they were indeed equally owned by me and Energenx having shared in the work substantially and under no non-disclosure or other agreements with Energenx or Bedini. The truth is that Bedini also learned from me in many respects and we benefitted from each other. You can see a sample of their attitudes towards me in that respect in those long videos showing a day in the shop. I don't claim much about myself, but I did contribute far more than Aaron and the later John gave me credit for. Without me there never would have been any products sold. And in fact Energenx worked for me in manufacturing and I never worked for them. I volunteered countless hours and helped improved their working conditions and freed up space in their shop by storing a lot of things, including John's expensive cars, for years. I also pushed forward a following or movement of thousands of people, which Aaron jumped into and hijacked and has greatly profited from. The Bedini's were always talking about making big money from all of this (always promising me stock in their company as well), but I was never in this for money. While I had no training in any of this, nor in sales, I did what I could to help people. You can fault me for promoting Bedini as I did, and for other mistakes, but I sincerely tried to do what I thought was best. We can't change the past, but some people want to lie about it to make themselves the expert and ruler over everyone. I have already shown how all these people are lying about me signing a non-disclosure with Bedini or Energenx. These people have at least three conflicting stories about the matter. First of all, Bedini was unwise in his befriending people and sharing everything with them as the stockholders would complain about. By doing that he prevented all ability to use or enforce NDAs (non-disclosure agreements). If you share things with the public, or give them access to your propriety information then you cannot later tell the same people or anyone else to keep the same private. It says that in their own NDA agreement used that they have to actually keep such thing secure, and also indicate that, and not let the public have access to it. Once I pointed this out to their lawyer he never called or contacted me again as he saw that point vividly. There were numerous ways they disclosed such private information. And trying to take it all back later was as foolish as John sometimes trying to force Yahoo to close down groups that posted information he freely gave out to the public. John created a walk-in museum eventually giving tours. It was a massive contradiction. It was an open-source environment by definition. The worst parts of this was that for years from 4AM in the morning, when the workers were come in, the front door was left unlocked and anyone could have had access to the upstairs museum, and three unsecured computers often left running for days and weeks, containing just about everything in the company. Other people's private information was also vulnerable, which also violates NDAs with anyone in that respect, as it goes both ways. The filing cabinet containing all important papers was unlocked and right beside the door!! That also had all the NDAs in it. Many people were allowed to use several of these computers (unsupervised for emailing) containing proprietary information that was unsecured. People were given tours of the shop while chargers were being built even though John used (worthless) potting to try and hide the parts. Crazy contradictions abounding... So by the definition and specifications in their own NDAs there was no bases for private information that needed to be secured and which people could be bound to keep private. It was all a big joke when the door was fully open to the public and people were invited to learn everything they wanted because John couldn't keep his mouth shut and effectively made this all open source. For months at the end we would record all contact with John and said so many things that would completely ruin his reputation if I published them. Especially my very last meeting with him where he shared exactly what he thought about all the people in the free energy community. It contains too much foul language to play, but shows what he really thought and how bitter of a man he was. He often talked behing people's backs and have that recorded about just about everyone. These Bedini worshippers really have no idea how he really felt about them. He had no respect for them because they fell for his big legend con and could never figure out his mystery puzzles he put out for people to solve (because he would rather play games than tell people the truth directly). What is actually the truth about the NDA controversy with Renaissance and Energenx is that literally the week we were moving out to get away from John (who would come into our shop and take up our time with his meloncholy ramblings and eventually threats to close everything down) he came in and wanted something. He must have got wind that we were moving and came in and wanted one of my harddrives, as well as a computer he gave us. The harddrive was mine and several years earlier he wanted me to back up all of Brett's computer before he was removed so that Brett would not be able change anything. John and I went through all the files for a long time. This he allowed me to do and I have abundent emails to back that up as well as testimony from my staff. But what does that matter when the public had easy access to such files anyway. Nevertheless I gave him my harddrive and that Big Mac. At the same time he then demanded that we all sign NDAs. My staff just laughed at him as at that point there was nothing in him to take him seriously about. We responded to him saying, that we had been opperating without any contract and NDAs for years and were not going to be put under something like that when it was all way after the fact. So this is actually the real story of what happened as 3 or four of us are witnesses of. Again, if I had already signed one, he would not really even need one from them as they would be under my company in that respect. But this was just as deperate an attempt to manipulate the past as Aaron now in his slander. This kind of open information for all mentality was all happening years before I got involved, and in several shops before the Hayden one. I came into such a relationship with John from the start. He never held back from me anything on the phone or when I first visited. You can see the video I took before Tony got rights on filming the motors. But how can you get rights on that when I was allowed to film it prior? They gave me the tour as they had so many others, and then later complained about having opened up that door. John was his own worst enemy as Aaron is now doing the same. Before showing me everything it would have been appropriate to have me sign an NDA in 2005, but they did not. They didn't with Stan Meyer (not the hydrogen guy with the same name), and John freaked out when I showed him that he was sharing the information John freely gave him, who also was not required to sign NDAs. Remember it was me who brought this to John's attention. But many years later he actually tried to change the wording and manipulate dates on emails to make it look different. I have shown the exact emails in video that I still have that clearly reveal how much John lied about this and betrayed me. Someone who was actually helping him and which at the time he very much appreciated, and said that to the public as well! If I had done something wrong to them at the time, then they would have not worked with me, promoted me, and praised me for seven years after. This is where John and Aaron contradict their own stories. If I was doing them wrong and/or making bogus kits then they would have addressed that at the time. But in fact both Aaron and John praised my work, as we can see John do in several videos, including at my conventions. They all made a lot of money from my work, and I even gave them lots of time at my conventions. A lot of money was made by them and associate compies because of my work. So let us consider their NDA contradiction claims in light of conflicting stories and timelines. The first claim is in the betrayal story of John's about the oscillator that Stan disclosed and which I informed John about. John there makes a statement that we signed NDAs with them which we did not. So that would have been 2005 or prior. The next claim is that NDA's were signed in 2007 at the time I started Renaissance. So which is it? Then Aaron and Tom Childs claim that they witnessed me signing NDAs while they were signing them. They present it like this all happened at the same time. But I only first brought Tom to the shop in late 2008 for the first time a year and half after starting the company (I have the picture of us with John Koorn date stamped and emailed). But they present it as if they were the same time. So what story do you wish to believe from these liars? 2005, 2007 or 2008? Maybe 2018 will be the next addition to their absurd story! The truth is that the Bedini's lived under constant guilt for their failures. And they changed the truth for a lie and substituted what they should have done with what didn't happen. They should have had NDAs when they didn't. Gary did talk about me signing an NDA in 2007 but didn't do it. Tom Childs did sign an NDA in 2008 but I didn't. Also, there is not a place for a signature on their NDAs, nor a notary or a third party witness signature. Just a line you print your name on, and places to initial here and there. I never filled out such a form for them, if anyone who had do so for no reason as they contradicted the terms stated. Anyway, if I had already signed an NDA in 2005 I wouldn't need to sign another one or two. So Tom Childs, in his zeal of worshipping Bedini, manifestly lies to say I signed one in 2008 with him. So after a year and a half of designing all the chargers I would then be expected to sign an NDA because Tom had graced us with his presence?? I have proven all this in the videos showing you actual email dates as kept by me all these years. These guys are so deep into their lies that they don't bother considering all the manifest contradictions. These guys are disrupters who are set on having you not succeed in this. Their fruit is known. My fruit is know. I have not had perfect customer service I admit. But I have given this my all. These guys love to tell and sell stories and try and bring down others. I wanted to just walk away but they had to attack because that is who they are. I only came out with the truth about Bedini because he never took down his slanderous lie about me on his one page, and because so many people had been deceived and confused by him in not only that matter, but in so many similar ways. Because I had largely contributed to the Bedini Lone Legend Myth I had to try and set the record straight. In doing that, however, it exposed the other liars and Bedini worshippers. And I have not shared more than a fraction of what could be shared in actual recordings I have of John saying everything you can imagine. I regret having to defend myself in this and the fact that this is not comfortable for the Bedini family. But this is beyond us, and the public has been manifestly deceived and harmed by so many things in this respect. Aaron represents the last fading entity trying to keep that destructive myth going, and he is profiting much from it. He wants to control me. He wants to control you by asserting authority that does not exist and by lying about transactions that he had no access to or had means of ascertaining the facts about. I actually said the other week that I wondered if Aaron would ever come around when he actually considers my work. We are supposedly trying to do the same thing. There isn't much difference in the theories we hold to about overunity. Why this war Aaron? So let's look at his recent claim in this context that he is ignorant of. Someone apparently brings out the fact that Benitez predated John in the technology a hundred years ago. This was a big point I made that is finally being realized. Benitez actually used Tesla's processes (from beginning with the 1891 resonance patent and then multiple other patents) and applied them to a unique battery rotating system. You can see the manifest similarity to Ed Gray's system 60 years later. No one seems to have made these connections in all these years. Bedini certainly did not mention Benitez to my recollection (and to give you and idea of how much I talked with John, it was like 3 hours a day besides lunch and regular work). The Tesla Switch is based upon the idea of Tesla Shuttle Circuits as Barrett outlines from other angles. Doing that with batteries was the Benitez contribution and so I more appropriately named it The Benitez Switch. However, Benitez actually understood how these things worked, and did not attempt to rapidly rotate batteries back and forth as John's Tesla Switch did (which I even show video of John admitting the process destroys batteries). In fact John and I once modified one of my chargers to self-charge and self-rejuvenate. I never sold that because it would ultimately ruin the battery plates and my first premise in the company is battery longevity (that was one reason I parted company with John when he wanted me to sell his own battery killer battery chargers after he got rid of Brett and tried to make his own). Anyway, Benitez was very important not merely for showing a simple application of these processes with batteries, but because he clearly stated, unlike Tesla, that you could personally have a self-sustaining system. He gave us both the proper Tesla Switch (which was with capacitors that could handle the rapid charging and discharging and not batteries that were damaged by doing that) and the proper methods of rotating batteries (that is not rapidly). Anyway, at least Aaron is admitting a tiny bit about Benitez finally. He doesn't give me any credit for that. Aaron says this has nothing to do with my Loving Paths teaching. Well I demonstrated it. Aaron does not have the technical ability to judge any of these things. Aaron says I am ignorant of how the process works and about the batteries. But who do you think did the most research on batteries all these years Aaron? It wasn't Aaron, who was instead selling information. It was me. I have spent my life charging batteries and I know a thing or two about them. I have been in contact with thousands of customers all over the world regarding proper battery charging and also about using the Tesla Switch to ruin them. Even John admitted that the Watson type of motor energizer (which is the same thing) was something that destroyed batteries so that he had to use two batteries. That is keep one in charge mode for a long time while another was in run mode. His first book admittedly (not in the book but he admits somewhat later) was a battery killer, but he did not ever clearly set the record straight. I had to learn this myself by experience. So when so many people told me of the same, I felt the need to teach on this and prevent people from wasting time, money and their faith. Aaron is not someone who has working experience in the things he is promoting. He can talk some talk because he sometimes hangs around people in the know. If he actually had real experience in the shop he would be supportive of my efforts and realize what I have been trying to do. So early Aaron promotes me as opposite to present Aaron. As for me stealing from John, what is the basis for such claims. I once thought John had invented many things, and that was the manufactured legend that was attractive to believe. You want to believe it. You want it to be true. A few years after I left association with these people I hired a top engineer and after a few months we realized we had the same experience with Bedini. He had 12 years prior to me business contract dealings with them that even went to court. In that battle, which he and other parties won, they uncovered a history of how the Bedini's had worked with others. It's not my point to discuss such matters, but my experience was not singular. And the other fact is that this technology did not belong to John. He had a few patents that he let expire way before their time. But he did not own all related ideas, or even the SSG circuit. The patents, like many were (for a short time) binding only on the specific methods used and never had authority over the prior art, especially referenced in the patent. If you spend a day looking over all the patents and prior art connections cited you can see from patents alone where John got his ideas from. Patents are not always fair and they do not at all imply that the owner of the patent has invented all of the ideas contained or really even any of the ideas. They may have only been the first to get a patent, and the patent office often grants patents that they should not grant because they violate previous active and elapsed patents because they get a lot of money in issuing patents. The top spinner patent was long expired. That contained the basic SG. This was not John's invention. I have word of who John directly got the idea from, but I actually suspect it was an influence from Ed Gray. Bringing up Gray reminds me of another important point in all this. Over the years I helped John in many ways, and one of the ways was sorting through and transcribing his lab notes. I in fact transcribed the SG story from the magazine as well as the window motor notes that appeared in the Bedini/Bearden book second publication (and transcribed many other papers). However, I noticed on the originals that the ink and pencil impressions were often not at all the same as the rest of the note on the same page. There was a clear difference in this respect, as you can even see in the copies, between the ones that were probably real (like in the later 80s and 90s') and the ones that were obviously fake or added in later (anything prior to 84 when John started out in this by his own admission in the Open Mind radio interview). I believe there was one as early as 1971. I remember having a real problem with that because it was not the same ink or handwriting and could not have been the right date obviously. The point is that John had clearly come back to these and added dates and no doubt this adds to the lies being believed by gullible people like Aaron (and I have to include myself in saying that as well). John actually told me many details about him and Ron Cole and how they tried to improve upon the Newman motor. We also talked about many other things he is known for, such as one of the battery chargers. Going back to the radio interviews in late 1984 you can see how new this all was to John that year. He talks about his invention saying how he always wanted to figure out how to combine a motor with a generator and finally did so after getting the idea from Bearden earlier that year. This was the first experience he had with anything that was so special in that respect. There was nothing prior to that. So there is no reason to believe that there was any prior visits or knowledge of anything overunity related in motors prior to hearing Bearden in early 1984. Visits with Gray prior to 84 are therefor suspect. You have some that say 1984 and others that say 1982. But listening to John in 1984 describe his coming to that point and how all of this was so new is not compatible with having met Gray and making such lab notes two years prior. The idea of making such a motor was only realized after listening to Bearden in early 84 unless that story was also not true. It is obvious that John was a man that changed dates around for his own advantage. He deceived the public in this respect with me in putting dates down that were 5 years later. Then with the NDAs. etc., So also with lab notes. This is all in the context of who really invented something and owns it. The fact is that John copied people as most people do. There is nothing wrong with improving upon things others have done or using what others have shown. But when you act like you created it, as Aaron is now trying to continue the myth, then you lie. People can discover things at the same time and not know it. But I watched John trolling the internet to try and copy people like Hutchison and so many others. Then somehow it went through his filter and became his idea. Aaron perpetuates that foolish deception that Gary Bedini hated and ridiculed every other day. Aaron is not just wrong in this respect generally about all of John's so-claimed inventions, but specifically about the SSG. Again, starting with the SG, it came from the 1974 (with prior art going back to the 30s I believe). 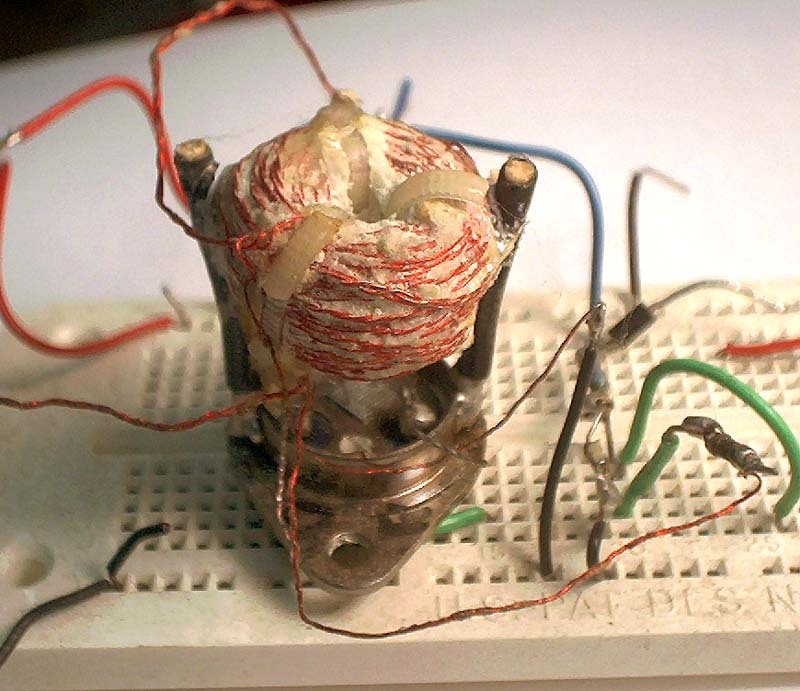 It is just a self-triggering oscillator motor that Bedini showed a 10 year old girl how to win a science fair with. That created a sensation for her and then was on Keelynet. And just prior to that a world-famous man claims to have told John about it which I find interesting. The SG was nothing new. The SSG was then just making a 2 battery version of it along the lines of the Benitez/Tesla concept of multi-body system. Bedini's patents did not actually cover the SSG as I wrongly tried to promote. They only covered the additions to that process. Aaron continues on with more bogus claims I will respond to. He says I have committed IP theft but does not demonstrate that. I have shown that Energenx/Bedini electronics had little actual intellectual property and no actual secured or undisclosed proprietary information in reference to the public. When I parted ways from Bedini I did not sell any battery chargers that were patented. Bedini's one battery charging patent only pertained to the dual process of charging a cap and then discharging it by a second mosfet. The patent was irrelevant to battery charging and rejuvenation so I didn't use it. And his radiant charging patent could not be used as a product as it was not compatible with the microchips and was too venerable to self-destruction. Brett discovered that with much testing and he also found that Peter's golf cart recovery with it was only to 50%. New chargers had to be made that were not Bedini designs even though Brett worked for Energenx. I don't want to create the impression that John did not contribute to the chargers or the free energy cause. But the fact is that he grossly distorted his contributions and claims to ownership as Aaron is perpetuating. Aaron's hostile and exaggerative spirit is manifest not just towards me but with anyone that may expose his lies. He needs this legend to be untouched. And he has foolishly overreached in his attempt to contain the lies. He has banked upon the fact that he has a lot of power in the the free energy community because of controlling major forums. But time is not on his side and the truth will eventually swallow him up as people realize all his lies and the lack of good fruit. I left him alone hoping he would find his way and actually get busy doing something to help people find what they were looking for. I thought some of the work with filming Dollard was a progressive step. But he is ultimately someone who doesn't care about the truth and people and is utterly ruthless and disrespectful. He can give me no credit but without my work, which he ripped off, he would have very little. I really don't care much, but I hope other people will not be harmed in the same way and I hope we can actually move forward. Just watch out for people that actually give you much without really giving you what you need. I don't want to go down as such a person, so I wrote a book that covers it all. Aaron doesn't want to get along with me, but what have I done to him? He calls me a sociopath and pathological liar, but who is the one being an example of such? He cannot even admit that he promoted me and my work before, and now acts like I never did anything good. At least I can admit his contributions and also Bedini's. I can rise above personal differences and find the truth and good even in my enemies. John was a friend of mine for a season. I knew him better than most people got to know him. We went out to eat every day together and most every Friday evening as a family. It pains me that he betrayed me. But it pains me more that so many people have been mislead and wronged by him and now Aaron in these ways. As for the claim about tools and equipment. I filmed and posted the last time I saw Gary Bedini, and John's wife. When I brought back some items to Energenx I asked Gary if that was all the equipment or tools they believed belonged to them. And he said yes. So why is Aaron lying about that and who made him representative of Energenx. That was 2013 and Aaron had nothing to do with them in that regard. As for the 30 coiler, my good friend paid for that 30 coiler to be made and demonstrated to others in my shop and at my convention. He was able to have this life-long dream realized and actually was filmed at my historic convention explaining how it worked. He really appreciated making that contribution. After the model had served it's purpose, and after John and I were parting ways and my business was dried up due to many related controversies with John, I sold that to someone and used the money to improve upon the system which this donating friend was fully sympathetic with. I have continued good relations with him and that is all private. But in fact this same man was very upset that he was ripped off in investing a large amount of money into Energex. He was a part owner, and there were so many people that were out a lot of money, like one more than 250k! This was merely conjecture and slander for Aaron to promote. Aaron makes other crazy claims as if I do not pay taxes or operate without a business license because I no longer have a business in Idaho! The bottom line is that he forgot to mention that I actually started World War I, World War II, and he knows that I have already caused World War III. I think anyone can see who is making things up here. I certainly have made my mistakes, but nothing of what Aaron has said. Let early Aaron 6-8 years ago speak for me. And look at all of the testimonies of my work that he copied onto his website show the same. I hope for better days. This work is not easy. I am no expert, just a hobbyist trying to help others at a time when vultures prowl and distract you from what is important. Beware of people that have no love and don't walk with you the extra mile. Time will show more and more who Aaron is. Hopefully he can salvage his own reputation and come clean. I am trying to do that myself. The bottom line is that he forgot to mention that I actually started World War I, World War II, and he knows that I have already caused World War III. I think anyone can see who is making things up here. The several post rant from Mr. Fried.... is certainly entertaining in a juvenile manner, somewhat difficult to read, since each extended thought runs on to another train of thought without a paragraph break. Unfortunately this method does not end and seems to continue forever. Definitely a Grade A for Verbosity but an E for Presentation and Logic. worked on it long hours and was now a Rick F. monopole. own creation and everyone knows that. saying that it is all his. full rights to something that was not his? beware. You might get snookered, of course Rick is saying that John B. It was Rick who failed his customers and he wants to hide those truths. Like Hillary saying Trump was in bed with the Russian's when it was Her. Same same psycho psyops, it's how a liar gets off. Tricky Ricky? Yup. do is say things to make a blot on John's record before the unwitting. His specialty was amplifiers, and many inventions. Last edited by BroMikey; 02-23-2018 at 05:50 AM. to his ear and turns his head while Rick begins to spin his web. John knew Rick was a mess but he still loved and encouraged him. John B. over looked Rick's delusional position seeking. Welcome to the real world boys and girls. It is what it is. Rick is seeking recognition and will stop at nothing to get it. Last edited by BroMikey; 02-23-2018 at 06:29 AM. What is your desired remedy to solve your problem? Eh... I actually prefer to live in the present and forgive our past sins and move on with our lives as we pursue our happiness of energy independence. All this back and forth and disrespect for our fellow man and even childish images such as portraying Rick as a baby. Isn't this a reflection upon ourselves? Have you ever heard of the term "Social Justice Wars" or "Social Justice Warrior" or "SJW"? Here we have a forum that is SUPPOSED to be dedicated to new energy studies and yet; we have this VERY political thread full of mud slinging. I have first hand personal experience with this kind of mud slinging which did result in substantial commercial injury damages that ultimately caused the complete shut down of an entire convention AND multiple social media forums including but not limited to facebook and twitter having to change their terms of service because their systems were being used to HARM other people with all the mud slinging and even threats of violence being thrown around by the SJWs who merely decided to have a problem with somebody else based on Assumptions, Presumptions, Deceptions and RUMORS and NOT who and what those other people actually are. Been there, done that and was personally harmed by it. This is one of the reasons I haven't been around for awhile in these forums. Because of all the very distracting CRAP being slung around and back & forth by misguided SJWs who ultimately DESTROYED their own convention that I was once proud to be a part of and did devote a substantial amount of my own time, energy and money helping to keep it going for years. SO; what is your PROOF OF CLAIM and desired REMEDY to solve this problem you decided to have with each other? The objective of any war and the duty of any warrior is to achieve PEACE. So; what will it take to achieve peace between honorable, respectable civilized people who allegedly have a common interest in these systems? Are we capable of being civil with other people and reaching a civil AGREEMENT-Treaty? What, EXACTLY, do you want Rick to DO and how shall he be compensated for any services he provides for the solving of whatever your problem is? What, EXACTLY, does Rick WANT? My impression is that he simply wants others to stop harming him with defamation as he is TRYING to move forward. And I do have an APPRECIATION that he actually does go to all this trouble, put up with all this crap and criticism and STILL manage to produce new and interesting things PLUS still be able to offer educational kits. And if all this crap makes him decide to just give up and shut down and do other things with his life then; what? Is this really what you want? Do you want him to just STOP working in this field and go away? If yes then; who you gonna yell at and blame at that point? Rick says he has recordings. I believe this is true and he can produce this. He also says there is nothing to NOT disclose if the information has already been disclosed by John and I believe this is also true. Legally speaking; Rick is correct. A NDA has NO FORCE and EFFECT if there is no effort by the first party to maintain that contract. If John did in fact put stuff out in the public then, the NDA is not worth the paper it's printed on and John had no grounds to try to 'pull it back' in or BLAME somebody else because he let his stuff get out there or he personally put it out there. Therefore I do not believe Rick is a liar in these aspects as well as others. He offers stuff and fills the orders. This is also TRUE. People can TALK all they want but ACTIONS have far more significance. They can say this and that but it ultimately boils down to; who can PROVE their claim? There are a LOT of claims being slung back and forth but no desired remedies. What, exactly do you WANT Rick to DO for you and what is the PROOF OF YOUR CLAIM? What is the cause and nature of the claim? What is the desired remedy? Do you want money and if so, what is the proof of the alleged damages? Do you want an apology for stupid stuff in the past and if yes; are you willing to forgive and forget and move FORWARD upon delivery of your desired remedy? He who is willing to sacrifice in order to achieve PEACE is the better man who actually is willing to SETTLE the matter by whatever means possible including self sacrifice. Are you willing to SETTLE this matter in order to SOLVE whatever problem you decided to have? Or; do you want this mud slinging war to continue indefinitely making ALL appear to be cry babies who FAIL to solve their own rivalries and controversies without help from the babysitter? BTW: Any User, forum, host, ISP or other wire system being used to Defame another could potentially be held liable for the TORT of defamation which is a VERY easy case to win. All Rick has to prove is that a defamatory remark or image was actually found on that ISP, server, service, forum, website or whatever wire service or user it may be. And BTW: IF there actually is a civil monetary claim beyond all this personal bickering over who said what or did what EVER in the PAST, then; GET over it and bring forth the PROOF OF CLAIM and SETTLE the alleged matter CIVILLY because; this 12+ month old thread is obviously NOT the solution. I can't just look the other way because the truth is uncomfortable. wires, nuts and bolts. Where is your honor? mine. You don't like it? Go find those who will care less. mind, there is nothing wrong with my mind. You are free to do as you may. Be ready to be pointed out. enjoyed anything about your lewd references to the public furries. It shows who you are in one short phrase. I like the HHO vid's. Last edited by BroMikey; 02-24-2018 at 09:35 PM. Scorch, all you're doing is proving you simply do not operate on a foundation of integrity OR you are simply not comprehending the facts that have already been spelled out through this thread where Rick trapped himself in lie after lie. You also do not know what you do not know about this situation and are expressing serious ignorance as you are sharing your perspective based on a lopsided argument by a known thief, liar and charlatan. You obviously are not able to analyze Rick's statements in their entirety and in the context of what all the actual eye-witnesses have stated about his claims. And, nobody has really even heard my side of the story because I haven't posted it yet. I don't even need to tell my story, I only need to show how each claim by Rick is yet another fabricated lie and I will do that when I feel like it. It is irrelevant what legal standing a NDA has - if someone fills it out showing the intent to honor one, it is at minimum a display of good faith, then one proves themselves to be nothing more than a dishonorable liar and deceiver when violating such an agreement. Rick was sent a cease and desist by John's attorney, which is the first normal action to enforce an NDA or any contract violation. Furthermore, claiming there was nothing to protect shows your ignorance and naivety on the matter. You are simply taking Rick's word for it that there was nothing to enforce. You simply haven't the faintest clue as to what would have been protected or not. John did give out a lot of information to the public - do you think he gave out EnergenX's proprietary IP? It is quite obvious that hasn't even crossed your mind or you wouldn't have posted what you did had you actually took the time to think about it. You're starting to sound like Rick. The charger circuits, software, etc. were NOT Rick's property and those developments and more were the exclusive IP of EnergenX and were absolutely covered by an NDA. It was EnergenX's property and was developed on EnergenX's dime and time. Rick had virtually nothing to do with those because he didn't have the circuit or programming experience. He even admits in his long-winded, lights are on but nobody is home ramblings that he did not do most it - that was in his latest drawn out psycho response about my posts. He did a lot of testing of the devices which were not designed by him, he gave feedback on the look and features of the charger, the controls, how the lights should look and the label - very superficial stuff - while Brett was the real designer and Rick even admits that. You should think first before sharing your ill informed opinion on the matter since you are led by a blind man. If you had the wherewithal to comprehend Rick's first slander against John and his responses that were first posted in this forum, you would see that he trapped himself in lie after lie after lie. First he denies that he ever filled out an NDA, then it was shown that he did. Then he claims it is a forgery - although there are multiple eye witnesses that he filled it out in front of them - then he goes on one lie after another after another after another digging himself a deeper hole by the minute. That is the method of the pathological liar - each bit of evidence that exposes such a person leads to that person going on endlessly on and on and on with nonsense to cover it up while trying to distract you with all of the misdirection. The greatest fear that the psychopath has is of being exposed. If you can't see that, you seriously need to wake up. I will address Rick's pathetic attempt to cover his lies as well as exposing his ridiculous claims against me - WITH PROOF - in my own time while doing my best to ignore those who lack the ability to understand or comprehend his sociopathic method of operation. What is the honorable thing to DO? Eh... on and for the record; anthropomorphic arts enthusiasts (furry fans) are just like any other subculture in human society such as stars wars fans, star trek fans, D&D fans, Comic fans or even football fans complete with garish body paint and furry mascots. All these subcultures all have conventions and they are all human beings who, surprise, surprise; are sexual beings. Plain and simple. These do include people from ALL walks of life of mother, father, airline pilot, trucker, postman, policeman, chemist, scientist, fireman, baker and thief. These conventions are huge and often involve 9,000 or more individual people and their families who attend and participate and operate these conventions in one weekend. This is a world wide phenomena just like any other such as comicon or dragoncon or trekcon or, for that matter, a new energy convention. Get it? It's a FANTASY! Are you the fantasy police? I respectfully ask with honor: What do you want Rick to DO for you? What is your legal proof of claim and what is your desired REMEDY that may be granted per the supreme law of this land? This IS the honorable, respectable and civil thing to DO among honorable men who are SUPPOSED to be EQUALS with RESPECT to each other. If you have a proof of a claim then by all means; what will it take to SETTLE this controversy in a logical, reasonable and CIVIL manner? Slinging mud back and forth and all this "he said she said" is NOT honorable or civil or settling anything. It merely PERPETUATES the controversy which is dividing and conquering us and destroying our new energy community. It is CHILDISH and indicates a NEED for a JUDGE to appear as Big Daddy Referee to help both sides of the squabble reach a peaceful agreement if they cannot be adult (civil) enough to settle it for themselves. And to judge somebody now and try to discredit him based on what kind of weird interests or beliefs he has or a convention he might attend or run is further evidence of childish mud slinging. Can we move beyond mere greed and fear of loss? Do we want peace in our new energy community? Do you want to settle the controversy? There are clearly TWO sides of the controversy so; in the best interest of SETTLING the controversy; what do you want to DO in order to achieve PEACE in our lives for the good of all concerned? What do you want Rick to actually DO per the supreme law of our land? Do you want an apology? Do you want his right arm? Do you want him to prove something? Do you simply want to ADVERTISE that you believe somebody did some thing wrong? Well then; already DONE! You have already done this so; what shall be the next act? First, I have no interest in your ridiculous attempts to set the stage for for a logical foundation on any of this. Second, Nobody asked you to step in as any kind of moderator so kindly keep your unwanted advice to yourself. Third, I said I would respond to Rick's psychotic claims on my own time, when I want. Until then, zip it up. You are clearly incapable of comprehending the fact that I already told you what was next. You're trying too hard to be clever and you are not showing what you know, you are showing what you don't. So the whole time Rick and his friends come to visit they take my information and pass it around like playing cards. It was later found out that they were making my oscillators and selling them without permission, nor would I ever give them permission, You the people be the judge of what was going on with this gang. So therefore the new sing. Last edited by BroMikey; 02-24-2018 at 11:44 PM. 1) What kind of man chooses to wait until ones death before making claims about them or their business, only a conman and or a liar does these things. For how is a dead man to defend himself? 2) Rick said he was going to repair my $1500.00 charger and has yet to do so. I assume I am never going to get it back as it has been years. My demands are repair my charger, I will pay for the parts and then return the unit back to me as that is what we verbally agreed upon. Last edited by jettis; 02-25-2018 at 07:06 AM. Then; WHY did you link this controversy in my own youtube channel if you didn't want me to come here? You are the one who invited me. And more than likely, it was your same act that caused Rick to respond with his 4 page statement of facts. And BTW; he is probably prepared to certify that statement and others as an affidavit of truth for the public record. If I were him; I would certify an affidavit of negative averment since you appear to be the accuser who suffers the burden to prove commercial injury damages and provide a remedy that may be granted per the law of this land. Is totally up to YOU guys to SETTLE your controversy. IF something was stolen then, by all means; either perfect a private administrative remedy or authorize a public civil complaint under penalty of perjury complete with a remedy that may be granted and file it into the court for resolution and let big brother decide for you. No need to keep this PUBLIC bickering up for 12+ months to the detriment of all including the Bedini family. has the most money can stall it all off til the other party gives up. Last edited by BroMikey; 02-26-2018 at 12:29 AM.